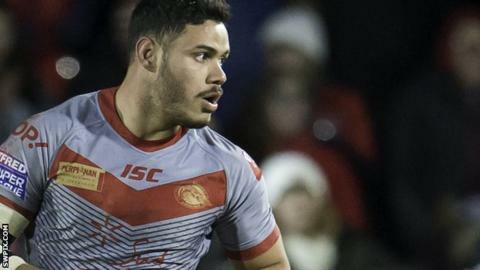 Centre Brayden Wiliame will remain with Catalans Dragons until the end of the 2020 season after signing a new two-year deal with the Super League club. The 25-year-old Fiji international has scored 17 tries in 42 top-flight appearances since his arrival in 2017. He will be looking to help Catalans win their first major piece of English silverware this weekend when they face Warrington in the Challenge Cup final. "Our best football is ahead of us," Wiliame told the club website. "I am happy to have sorted my future at Catalans leading into the challenge cup final"
Catalans coach and former England boss Steve McNamara said the former Many, Newcastle Knights and Parramatta Eels centre has been one of the Dragons' "most consistent performers" in a season that has seen the Perpignan club rise from being relegation battlers to Super League play-off contenders. "We feel his best years are still ahead of him," McNamara said.